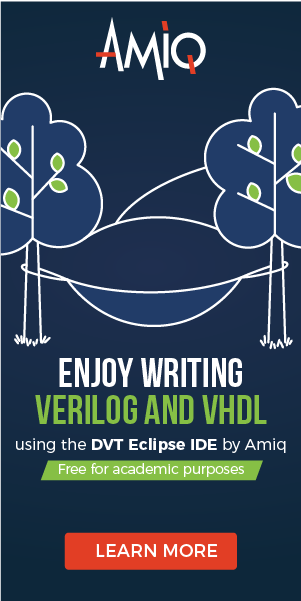 This VHDL project is the VHDL version code of the digital clock in Verilog I posted before(link). 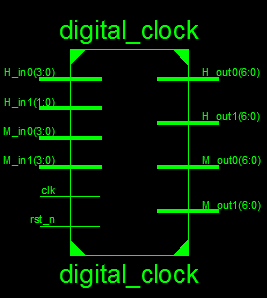 The VHDL code for the digital clock is synthesizable for FPGA implementation and full VHDL code is provided. This digital clock is a reconfigurable 24-hour clock displaying hours, minutes, and seconds on seven-segment LEDs (Tutorials on 7-segment LEDs: here). Besides, users can manually set the time of the digital clock including hours and minutes through switches. -- defined by the H_in1, H_in0, M_in1, and M_in0 inputs) and the second to 00. -- For normal operation, this input pin should be 1. -- Valid values are 0 to 2. -- Valid values are 0 to 9. It is noted that when you run the simulation, you should use direct clock from input to simulate instead of the 1-second clock or reduce the value of the divisor in the clk_div entity because it would take a long time to create the 1-second clock. I am having an error of : quartus design library work does not contain primary unit "clock_div"! Can anyone help? can i get truth tables and k maps for this project? Sorry, I don't have truth tables or K map for you. We dont have it. Just assign the IO ports to necessary IOs on your FPGA board. Hi, I would be very grateful if someone could help me. The code compiles with no error but when i simulate it the simulation resets after the digital clock reaches 05:06.